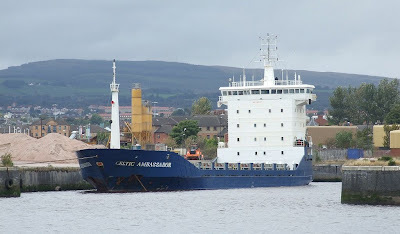 Having arrived on Friday 14 September, CELTIC AMBASSADOR loaded a cargo of scrap metal at the former Lobnitz Basin in Renfrew, but has since moved across the river and is now berthed on the west wall of Rothesay Dock. Built in 1994 with the same name that she bears now, she has twice been renamed. From 1994 until 1996, she was named FAIRWIND, and in 2005 she was given the name LUCY BORCHARD for a year. Such renamings are common, usually when vessels go to other operators for a charter. Many of the container ships visiting the Clyde are examples of this. CELTIC AMBASSADOR is a British-flagged ship, owned by the Willie Group of Cardiff. She is 3,739 gross tons, and her deadweight is 5,788 tonnes. 92.8 metres in length, she can be used to carry up to 381 containers, as well as bulk cargoes.